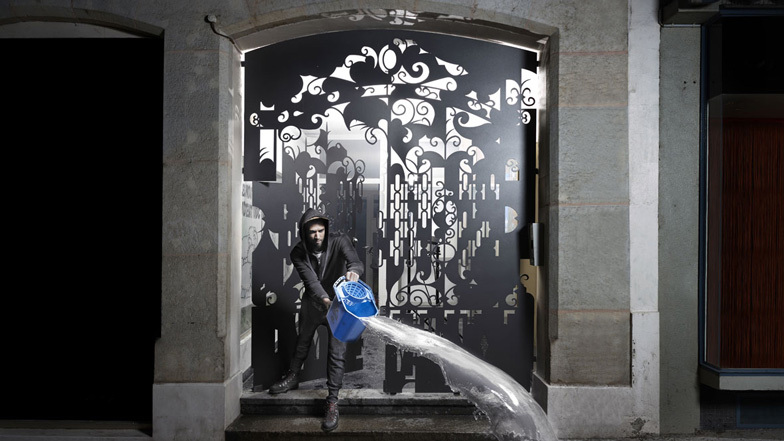 Swiss architects Bureau A have created decorative steel gates to discourage nocturnal "illegal activities" in the entrance to their Geneva studio. Instead of designing an opaque barricade, the architects came up with a concept for a perforated gateway that would be both secure and ornamental. The elaborate designs draw inspiration from textile designer William Morris and artist Kara Walker, and are laser-cut into the 10 millimetre-thick steel. Bureau A also recently worked with students to create a travelling commune inside a collection of shipping containers - see the project here. Photography is by Federal Studio. The realization of THE PORTAL, the latest design of Leopold Banchini and Daniel Zamarbide of BUREAU A, has just been completed. Located in the centre of Geneva, Switzerland. Régis Golay from federal studio has produced some images of the design piece. Like many places within the urban fabric the tiny area of intervention was of problematic nature. By the slight retreat of the street it formed a dark entrance close to some of the hot places in Geneva, hidden from direct views. It constituted thus a perfect place to hide and realize some of the things that are not allowed in our institutional life, a perfect nightspot for illegal activities. The portal appeared thus as a problem-resolution sort of project, the sort of project that is best served by the design of a wall with the pragmatic ambition to solve social issues or report them somewhere else. Within the modest size of the intervention it emerged during the short process of design a belief in the utopian decoration claimed by William Morris. The portal wanted to demonstrate the pleasure of designing and fabricating a decorated surface that could scape from the problem solving design formula. The modest utopia in this case would be to replace vandalism and nightlife odours by a naïvely ornamented pleasure. The same ingenuity sincerely believed in the Alice in wonderland effect that transforms a simple door into a magical threshold to be enjoyed on a daily basis. The portal proposes a game of light and shadows, appearance and disappearance through a very classical pattern that has been playfully modified by filling in or emptying the metal surface. On another angle, the project was confronted to urban and city regulations and official commissions that lack of real competence on historical matters when it comes to intervene on sensitive ancient sites. They tend to find shelter on standards of contemporary recipes and catalogues of possibilities that might or might not be adequate when studied thoroughly. The portal wanted to play around the idea of what is classical and how much the question of contemporaneity needs to be addressed and constitute an issue or not. Manipulating a stereotype pattern borrowed to a traditional French blacksmith the design wanted to address the question of modern craftsmanship as much as the transmission of a certain vernacular classicism in dialogue with our own 2012 culture. The installation of the portal in this context of debate around classical, vernacular and contemporary languages in our city was an attempt to address the absurdity of these debates and place the aesthetic pleasure of design and craftsmanship at the centre of our preoccupations. In a sort of Kara Walker approach (particularly her work on black cut-paper silhouettes in dialogue with folklore traditional images from the south of the United States) the Portal uses the communicative potential of traditional patterns.